One motivation for learning fabric crafts is to be able to transform dull old clothes into something more exciting. 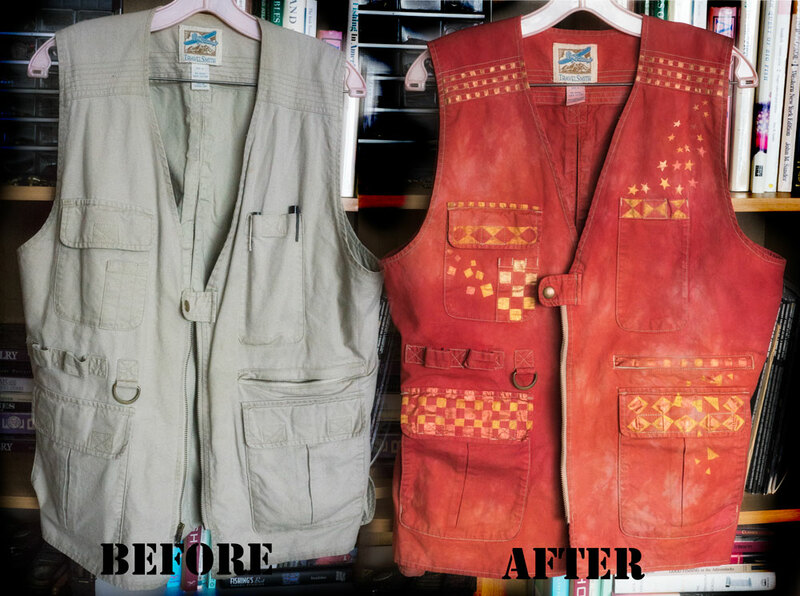 Here's how I upgraded my old travel vest. Dyeing prep. To use Rit dye, the garment needs to be made of a natural fiber -- like, cotton or cotton blend. Polyester will not absorb any dye. Wash the item to remove any sizing that will interfere with absorption of the dye. Dyeing. I used the Low Water Immersion technique described in this article by Rit (with other useful info provided in this video by Glenda Hopp). Using the minimum amount of water in the smallest possible container creates the mottled effect because the dye can't penetrate evenly though all the cloth. Adding a second color makes the result even more interesting. After soaking the vest above in hot tap water, I stuffed it into a 10-cup microwave-safe container, with a solution of 2 teaspoons of Rit Tangerine liquid dye with about 3 c. hot water. I topped it off with 2 teaspoons of Rit Scarlet liquid dye in 2 c. hot water. After a minute in the microwave the process was complete. For full how-to details see the Rit article. I wound up dying the vest twice with this method. The first results were pale, caused (I think) by the fact that the vest had never been laundered. But "overdying" is a time-honored practice and it didn't take much more time (see video). Painting. For the decorations, I used Jacquard Lumiere fabric paint in various shades of metallic gold, applied with a narrow, stiff brush (to more or less scrub a thin layer of paint into the fabric). If you don't have fabric paint, any acrylic paint will do, but it should be mixed with a fabric medium like Golden GAC-900 to keep the painted fabric soft and washable. Method 1. I used strips of drafting tape to outline shapes and to keep the edges sharp. Blue painters tape also works. Watching Jacquard stenciling videos featuring Diane Ericson (Part 1, Part 2, Part 3) gave me some confidence, though I didn't use a sponge... nor any of her advanced techniques. You are supposed to wait 24-48 hours after painting, then heat-set the paint with a hot, dry iron, from the back side, for 3 minutes. That seemed like an excessively long time -- I was afraid of burning it, even though I was using a press cloth in between. I wound up throwing it in the dryer on high for about 20 minutes. While I don't plan on laundering this garment very often, I'd like to know it could stand up to a washing. Speaking of washing: it's recommended that all freshly dyed/painted fabrics be washed separately (I'd add, in cold water) till you're sure it won't ruin the rest of your laundry load. Design notes. The polyester thread used on the vest didn't absorb any dye, so gave me lots of lines and triangles as a starting off point. I had to paint my little rows of checks and diamonds before I could have my squares wandering off and stars bursting from my pocket. On our second glass of wine last night, my friend Sue and I discussed different forms of creativity. Some people can look at a blank sheet of paper and throw down something smooth, balanced, and marvelous. But some of us (maybe the "left-brainers") have to start with a some kind of grid -- some kind of logical infrastructure or armature to hold our tight little patterns. Maybe the first type of artist is less about the craft, more about the vision. Maybe the second type -- me -- finds that laboriously mastering a craft is the path that after a while begins to liberate the creative vision and gives me permission to color outside the lines. "Easy short-cuts" usually spell disaster. Yesterday, Pat rediscovered this little exercise I did in 2010 -- creating a sort of maze by blocking out words on a page, then having my character dangling, crawling, clutching, lurching her way through. To me, that's the creative process.